I got together with Josh, a Conquent alumnus who's working at Powell's in their ecommerce division. We met at the Muddy Rudder, which happens to be on the same block Markie and I live on, and underscores one of the things I love about living in Portland. Right in our residential neighborhood is a pub with live music most nights, a dozen taps or so of really good beer, and a roaring fire (a chair broke at the table next to us, and the owner promptly added it to the woodpile -- it's that kind of place). While they have wireless, you see more people playing cards or games than folks on laptops, and I like to refer to it as a "biker bar" because of the large number of cyclists who drop in because of its proximity to the Springwater Trail. 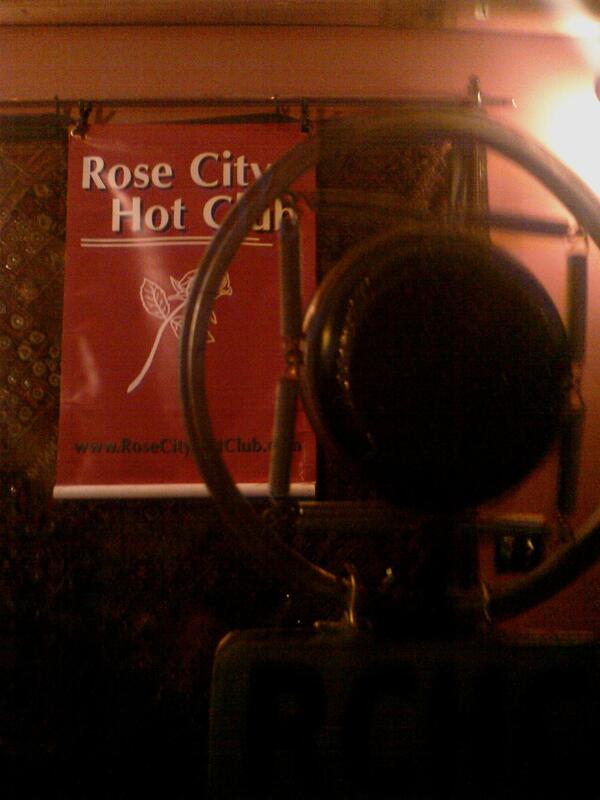 The music last night was the Rose City Hot Club, which usually has more than the two guys we heard, but two guys filled the room with a 30's revival jazz sound (think Django Reinhardt) -- one with a stand up bass and the other switching between guitar and fiddle. This picture, by the way, is of the band's "vintage" microphone, made from tuna cans and old springs -- it looks great and really works, too (although he turns down the bass all the way so it sound tiny like an old-timey microphone would). And then there was the woman who they invited up to sing a few songs; not the warbley, off key singing you'd expect in a local pub, but a great voice, and a good pace, hitting complex changes. It's the kind of thing you expect to see promoted for weeks beforehand and pay a hefty cover, not something you just drop into when meeting a friend for a beer.